The Norns spin the threads of fate at the foot of Yggdrasill , the tree of the world. In Norse mythology, Norn (plural: Nornir) refers to a trio of goddesses who measure and regulate the fates of all beings including humans and deities. They are also known as the Weird Sisters, (sometimes Wyrd Sisters), after Urd, the first of the Norn, whose name means itself "fate." According to Viking lore, the Norns live beneath the roots of Yggdrasill, which is said to be at the center of the cosmos, where they weave the tapestry of fate. Each person's life is said to be a string in their loom, and the length of the string is said to be the length of the person's life. Additionally, the term "Norn" signifies a general "spirit of destiny," which accompanies an individual throughout their life and ensures the achievement of their respective fate. This notion of a legion of individualized Norns, each assigned a particular being, possess some marked similarities to the Hellenic views on daemons and to the popular Christian understanding of guardian angels. As Norse deities, the Norns belonged to a complex religious, mythological and cosmological belief system shared by the Scandinavian and Germanic peoples. This mythological tradition, of which the Scandinavian (and particularly Icelandic) sub-groups are best preserved, developed in the period from the first manifestations of religious and material culture in approximately 1000 B.C.E. until the Christianization of the area, a process that occurred primarily from 900-1200 C.E.. The tales recorded within this mythological corpus tend to exemplify a unified cultural focus on physical prowess and military might. Within this framework, Norse cosmology postulates three separate "clans" of primary deities: the Aesir, the Vanir, and the Jotun. The distinction between Aesir and Vanir is relative, for the two are said to have made peace, exchanged hostages, intermarried and reigned together after a prolonged war. In fact, the most significant divergence between the two groups is in their respective areas of influence, with the Aesir representing war and conquest, and the Vanir representing exploration, fertility and wealth. The Jotun, on the other hand, are seen as a generally malefic (though wise) race of giants who represented the primary adversaries of the Aesir and Vanir. Over and above these three, there also existed races of secondary supernatural spirits, including the alfár (elves) and the dwarves (craftsmen for the Aesir). Among the deities of the Norse pantheon, the Norn are distinctive for their roles in determining the fates of both humans and deities. In this sense, their respective functions can be seen as ontologically primary (i.e. more fundamental to the basic operation of the cosmos) than those of all other gods, despite their comparatively smaller place within the mythic corpus. According to the thirteenth-century Icelandic historian Snorri Sturluson, in his Prose Edda, the Norns are described as three women who personify fate as its arbitrators. A hall stands there [in Asgard], fair, under the ash [Yggdrasill] by the well [Urðarbrunnr, the "Well of Fate"] and out of that hall come three maids, who are called thus: Urdr, Verdandi, Skuld; these maids determine the period of men's lives: we call them Norns. Urd is similar to the past tense of the verb verđa, "to become" and thus means something like "Became" or "Happened." It is cognate with Old English wyrd, "fate, destiny" ansd related words in Old High German and Old Saxon. Verdandi is the present participle of verđa, "Becoming" or "Happening." Skuld is derived from the modal verb skulu, which is cognate with English "shall" and "should," and probably then means "Is-to-be" or "Will-happen." In this way, the Norns signify "the past, the present, and the future." Given both their number and their role(s), it is perhaps unsurprising that they have often been compared to the Greek Fates (Moirae). The role of the Norns exemplifies the ultimately fatalistic nature of the Norse mythic/religious complex, where the future was seen as being ultimately preordained, as evidenced by Odin's sacrifice of an eye for a vision of the end times (Ragnarök) and Balder's precognitive dreams of his own demise. Indeed, every being, both divine and human, had an alloted place in this cosmic order, which was foretold by these three Wyrd (Urd) sisters. There are many norns: those who come to each child that is born, to appoint his life; these are of the race of the gods, but the second are of the Elf-people, and the third are of the kindred of the dwarves. It is here that the universality of the Norns is attested, as the three "races" of these beings suggests that they minister to the Aesir and humans, the elvish people, and to the dwarves (i.e. to all classes of natural and supernatural beings). Further, the overall quality of one's existence (in terms of the trials and tribulations one will suffer) is determined by the norns themselves: "Good norns and of honorable race appoint good life; but those men that suffer evil fortunes are governed by evil norns." In this way, they possess a striking similarity to the Greek daemons, who regulate the lives of individuals – effecting their opportunities, their fortunes, and even their dispositions. 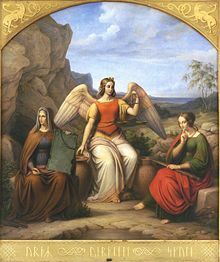 This romantic representation of the Norns depicts one of them with wings, which is contrary to the folkloric accounts. 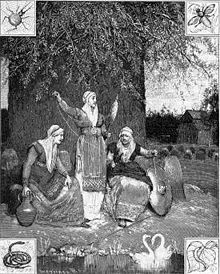 These Norns who dwell by the Well of Urdr take water of the well every day, and with it that clay which lies about the well, and sprinkle it over the Ash (Yggdrasill), to the end that its limbs shall not wither nor rot; for that water is so holy that all things which come there into the well become as white as the film which lies within the egg-shell. On the wood they scored,— | and Skuld the third. Though this selection seems to parallel Snorri's prose text, it contains one major difference: a stress upon the role of the Norns in making cosmic "laws" (over and above their already established role in determining the fates of individuals). In the hall of the moon. This general tendency is summarized by Orchard, who notes that the "Norns are often depicted at the birth of great heroes, and their role in determining the course of an individual's destiny is celebrated in numerous poems of the Poetic Edda ... as well as in other legendary narratives." ↑ However, some accounts have it that they dwell above the arch of the Bifrost Bridge. ↑ More specifically, Georges Dumézil, one of the foremost authorities on the Norse tradition and a noted comparitivist, argues quite persuasively that the Aesir / Vanir distinction is a component of a larger triadic division (between ruler gods, warrior gods, and gods of agriculture and commerce) that is echoed among the Indo-European cosmologies (from Vedic India, through Rome and into the Germanic North). Further, he notes that this distinction conforms to patterns of social organization found in all of these societies. See Georges Dumézil's Gods of the Ancient Northmen (especially pgs. xi-xiii, 3-25) for more details. ↑ Snorri Sturluson, Gylfaginning XV, Brodeur 28-29. ↑ Given that tales of three specific Norns (Urd, Verdandi, and Skuld) are relatively rare within the Norse corpus (Lindow, 244), and that Urd is often described alone (and as a more impersonal embodiment of fate) (Turville-Petre, 279-280), it seems reasonable to concur with Munch's theory that the parallel between the Norns and the Greek Fates was a purposefully, syncretic development (Munch, 301). ↑ See, for example, DuBois 49, which describes the reliance of the religious public upon instruments of "chance" to determine the correct course of action. Since the future was preordained, these apparently random outcomes would actually indicate one's fated course. ↑ Snorri Sturluson, Gylfaginning XV, Brodeur 29. ↑ Snorri Sturluson, Gylfaginning XVI, Brodeur 30. ↑ Völuspá 20, translated by Henry Adams Bellow and accessed online at sacred-texts.com. Emphasis added. Retrieved April 13, 2007. ↑ Lindow agrees with this interpretation (244). ↑ Helgakviđa Hundingsbana in Fyrra, quoted in Munch, 156. Burkert, Walter. Greek Religion. Cambridge, Mass: Harvard University Press, 1985. ISBN 0674362810. Dumézil, Georges. Gods of the Ancient Northmen. Edited by Einar Haugen. Berkeley: University of California Press, 1973. ISBN 0-520-02044-8. Grammaticus, Saxo. The Danish History (Volumes I-IX). Translated by Oliver Elton (Norroena Society, New York, 1905). Accessed online at The Online Medieval & Classical Library. Sturluson, Snorri. The Prose Edda. New York: American-Scandinavian foundation, 1916. Available online at http://www.northvegr.org/lore/prose/index.php. Turville-Petre, Gabriel. Myth and Religion of the North: The Religion of Ancient Scandinavia. New York: Holt, Rinehart and Winston, 1964. ISBN 0837174201. "Völuspá" in The Poetic Edda. Translated and with notes by Henry Adams Bellows. Princeton: Princeton University Press, 1936. Accessed online at sacred-texts.com. Retrieved April 13, 2007. This page was last modified on 23 January 2015, at 21:18.